Discussion in 'Google TV General Discussion' started by sparkyscott21, Jan 7, 2011. 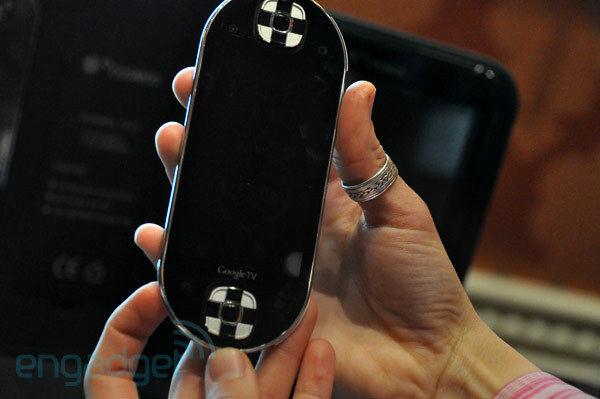 Ocosmos wasn't only showing off a new duo of Windows 7 handheld gaming machine here at CES, but also a newfangled remote in its O-Bar line. This guy is an ultraslim Bluetooth remote, designed to control set-top boxes, game consoles and connected HDTVs. Details were a little unclear (to say the least) on how exactly it would all work, but apparently the company's supremely interested in licensing out the technology underneath of it for use in other remotes. We get the impression that El Goog doesn't know about that Google TV logo there on the bottom, and folks at the booth noted that this was just a mockup for demonstration purposes. The goal here would be to place a virtual keyboard on the capacitive display, then enabling couch dwellers to bang out searches for shows on their set. For reasons unknown, there are also a pair of shoulder buttons at the top, possibly for embedded games. This one's expected to ship later in the year for an undisclosed amount, presumably sans the Google branding.